The ingredients for this product are very specific to this region. The spelt of Garfagnana must be grown on suitable soils within a range of altitude of 985 and 3280 feet above sea level. The production of the Garfagnana spelt must take place in accordance with normal practice in the area, which is without the use of chemical fertilizers, pesticides and herbicides. There is also a limit to how much can be produced, which is a maximum of 5,511 pounds of farro per acre. The Po bread is generally round and is about 2 pounds. Bran, flour, yeast, water and salt are needed in order to prepare this bread, along with using traditional methods. The product owes its traditional characteristics to the soft wheat flour and bran, which are produced at local mills. Also adding to the uniqueness of this product is the baking process, which takes place exclusively in a wood-burning oven. This specialty bread is small, brown in color, and has a soft texture. Made with chestnut flour, which provides the flavor and aroma of the bread. It is typical to bake the bread on stones placed on the fire. It is traditional to eat warm with cottage cheese and rolled into a cannoli shape. Marocca di Casola is a bread made with chestnut flour, corn flour, boiled potatoes, sourdough starter, brewer's yeast, water and salt. After the ingredients are mixed together, it is then baked in a wood-burning oven for 45 minutes. Typically this bread has a dark brown color with a chestnut fragrance. The Lunigiana Testalo is an ancient pasta, dating back to the imperial Roman times. It has become a traditional Tuscan cuisine over the last centuries, and is known for being simple and genuine. Testarlo is still made with only a few ingredients which consist of flour, water and salt. The recipe of this pasta has been preserved from the past with care and respect by the people who make it. The Castagnaccio is a chestnut cake and is known for its Tuscan sweetness. It is a typical dessert consumed in the fall. It is made by chestnut dough, water, olive oil, pine nuts, and raisins, and then is baked. Other local variations may include other ingredients, such as rosemary, orange rind, fennel seeds, and other dried fruit.Castagnaccio is best served with ricotta, chestnut honey or sweet wines. Pattona is made from chestnut flour and cooked in a wood oven wrapped in chestnut leaves, which gives the bread its original flavor. This bread is round, petite and it has a diameter of approximately 2-3 inches and is only about ½ -¾ inches thick. The Pattona di Comano owes its uniqueness to the use of local chestnut flour and chestnut leaves during cooking. 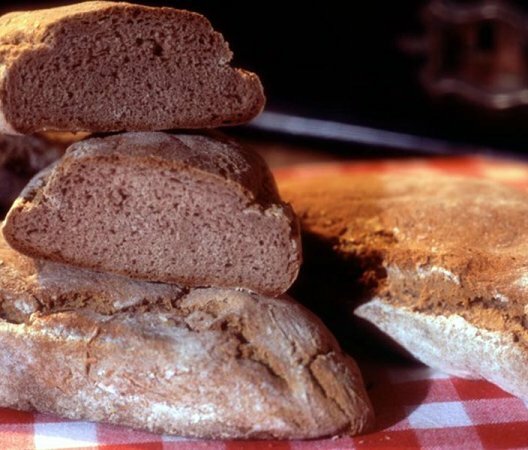 When eating this bread it is recommended to eat it in accordance with Comano tradition, which fuses all the derivatives of chestnut flour (polenta, chestnut cake, fritters and crepes) with dairy products such as cream, ricotta cheese, mature or fresh cheeses. Zuccotto is a semi-frozen dessert made with sponge cake, liqueurs, and ice cream. It has a round, dome-like shape with various colors ranging from light brown to dark brown. This dessert has a very sweet liqueur flavor. It has a soft texture and is consumed cold. Only one producer makes Zuccotto Massese, where it is produced in limited quantities of 11,023 pounds annually. It is sold exclusively in the area in which it is produced. Crisciolettes are like big pancakes, typically about ¼ inch thick. The dough is made by combining corn flour and durum wheat flour with water. Today salt is always put in the batter, although it used to be a precious commodity that was only used when it could be procured by bartering agricultural produce or livestock. Once the batter is made, it can be poured onto a hot griddle iron (known as "testi" or "cotte"), and then slices of pancetta are placed on top. After 2-3 minutes the pancake is removed from the heat and consumed piping hot. They can be eaten with slices of pancetta or a good cow's milk cheese. This is bread with a notable list of ingredients. The recipe calls for wheat flour, 15% boiled potatoes and mashed potatoes, sea salt and yeast. The potatoes that are used are local and help make the bread particularly soft and tasty. The wood that is used for baking this bread is Oak. After about an hour in the oven, the bread is ready to eat. The bread does not have a strong potato flavor; the ingredient is used more for texture. Overall this bread pairs well with cured meats like salami. The Carscenta is a typical fresh cake. It is made by mixing together flour, sugar, eggs, milk, butter, cream, yeast, raisins, pine nuts, and anise. The aroma from the cake is a direct result of its unique list of ingredients. The flavor of this product is sweet and is a representation of culinary traditions that have been handed down from mother to daughter for generations. It is hard to find a recipe written with the correct amounts of each ingredient and proper cooking times, for all is entrusted to the skilful ability of Comanine women. 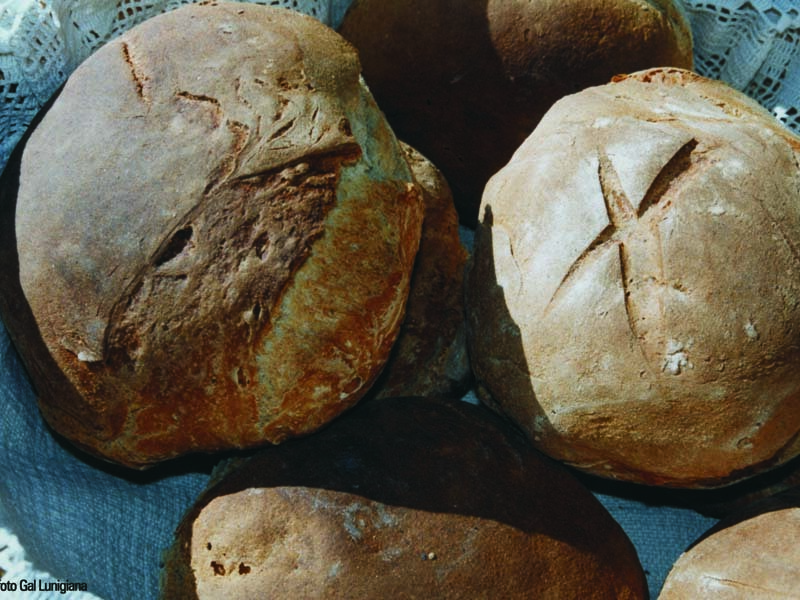 The panigaccio is a type of bread, which is unleavened and cooked in a special clay pot, called "text". Panigaccio is round and has an off-white color. It has a fragrant aroma. It can be cooked in an oven or over an open flame and its ingredients are a batter of flour, water and salt. The final consistency is soft or crunchy, depending on the cooking time. The product owes its characteristics to the production technique and the particular materials used during preparation. It should be eaten while hot, accompanied by cured meats and cheeses or drizzled with extra virgin olive oil and a sprinkle of grated cheese.